Cinnamon oatmeal with dried cranberries is a staple around my house*; the oats are good for my heart and digestive system and the cranberries help to prevent UTIs. Plus it’s delicious, hello! 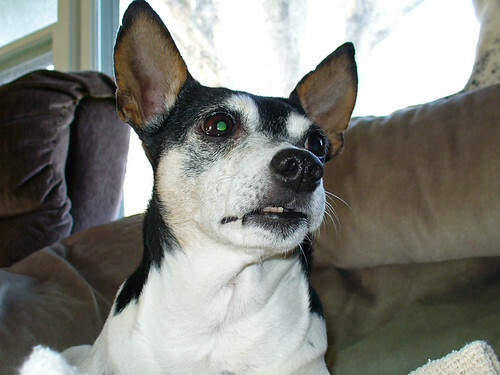 Even the dogs get into the act come breakfast time, begging for their daily serving of cranberries. (Or, in Mags’s case, demanding.) It’s a family affair. Given my passion for oatmeal (too much? ), this dessert was inevitable. Unstoppable. HAD TO HAPPEN. 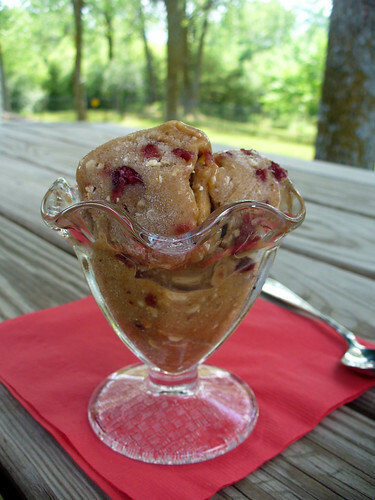 I give you: Cranberry Cinnamon Oatmeal Soft Serve – cranberry cinnamon oatmeal in soft serve form. With bananas, ’cause you should always bring a banana to party. 1. Combine 1/4 cup of quick oats, 1/2 cup of water, and 1 teaspoon of cinnamon sugar in a microwave safe bowl; mix well. Microwave for 60 seconds and stir again. 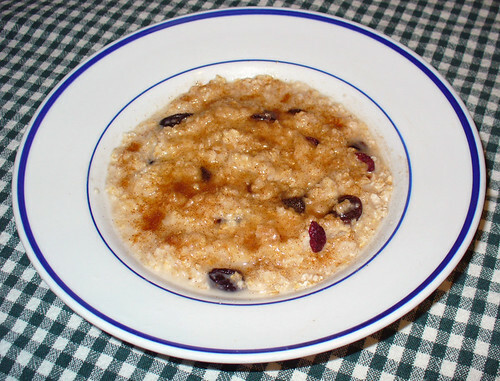 Allow the oatmeal to cool to room temp, either on the countertop or in the fridge. 2. Put the bananas in the food processor and pulse until smoothly blended. Most likely you’ll need to stir them by hand several times, as the frozen chunks tend to gather and become “stuck” on one side of the bowl. If necessary, add a splash of non-dairy milk or creamer to get things moving! 3. If the bananas aren’t sweet enough for your taste (sometimes this happens if you freeze them before they’re sufficiently ripe), add a bit of sugar to taste. Any sugar works fine – white, brown, etc. – but I find that powdered sugar results in a smoother blend. 4. Add the oatmeal, 1 teaspoon of cinnamon, and 3 tablespoons of cranberries and pulse until well blended. 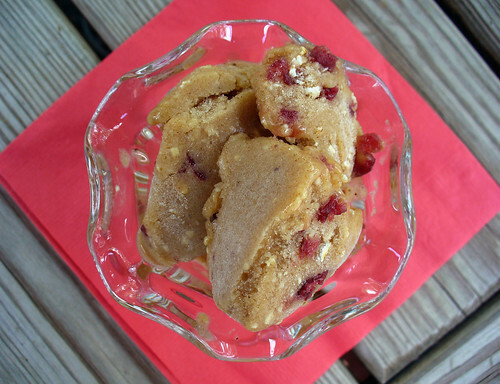 Add the last three tablespoons of cranberries and the 2 tablespoons of quick oats and pulse several times, just enough to mix the cranberries and oats into the ice cream batter (but not enough to chop them up into small bits). 5. Transfer the ice cream to an airtight container. Enjoy immediately as soft serve, or pop the ice cream in the freezer for an hour+ for a firmer dessert. Store any leftovers in the freezer in an airtight container. If the frozen banana ice cream proves too hard to scoop, microwave it for ten seconds to help loosen it up (or let the container sit on the counter for ten to thirty minutes prior to eating, depending on room temp). 6. Serve with a dusting of cinnamon sugar for extra shiny measure! 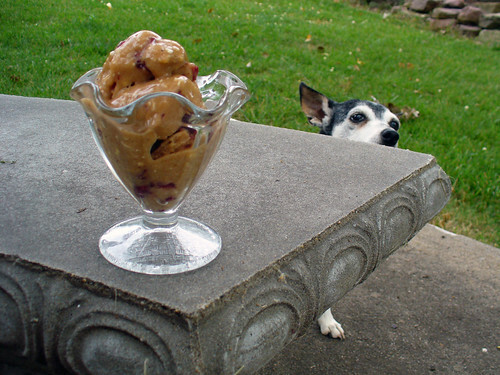 Kaylee creeper, wants some ice cream! What’s that? 1,001 ways to enjoy oatmeal? Surely I exaggerate! Actually, I think I’m underestimating the many, many ways one can serve a seemingly simple bowl of oatmeal. Don’t believe me? Keep on reading for 123 basic ingredients (most of which come in several different forms, flavors and whatnot) that can allow you to enjoy oatmeal every day for a year – without ever making the same dish twice! Shane offered to write a script to generate every possible combination of the ingredients I’ve compiled below, but that would be a little much, dontchathink? Not to mention, gross and overwhelming: A bowl of oatmeal with white and brown sugar, agave nectar, maple syrup, chocolate soy milk, chocolate chips, cocoa powder and chocolate-covered soy nuts might very well send you right back to bed with a sugar headache to beat all sugar headaches. * Rolled oats cooked in water, sweetened with maple syrup, and garnished with a handful of pecans – the perfect morning pick-me-up! 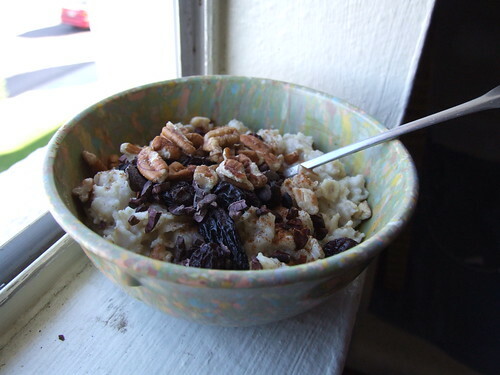 * Quick oats with vanilla soy milk, a dash of white sugar, and fresh and dried blueberries – yum! * Chewy rolled oats mixed with peanut butter and strawberry jelly – brown bagging it to the office, anyone? * Steel-cut oats flavored with a cup of chai tea, sweetened with a squirt of agave nectar, and topped off with a generous serving of cranberries – why aren’t more restaurants on the oatmeal bandwagon, yo!? At first glance, some of the ingredients I’ve thunk up may strike you as a little odd: marshmallows and chocolate chips in oatmeal!? While I don’t recommend that you make a habit out of marrying oats and jelly beans, candy-decorated oatmeal is a delicious indulgence. And nostalgic, too! : As a kid, I hated oatmeal. Loathed the stuff. Well, the “boring” (read: healthy) “adult” oatmeal, anyhow. When my mom occasionally bought the fun, cartoon-themed, kid-oriented flavors, I downed oatmeal with gusto. I can still remember this one variety of oatmeal (Quaker, probably), which had these little gummy dinosaurs mixed in with the quick oats. Once the “eggs” met with water, the candied exterior dissolved, “hatching” the dino beneath. (From ages 6 through 13, I fancied myself a budding archaeologist, you see.) Ah, memories! 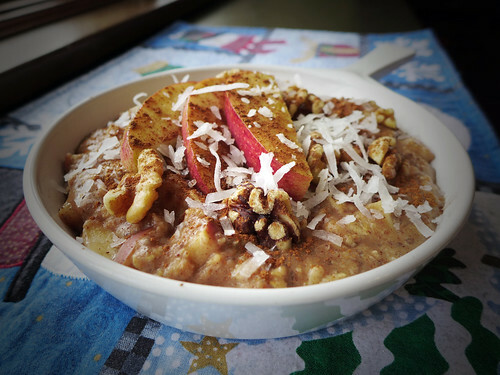 Now that I’m older (and more health-conscious), I no longer eschew “boring” oatmeal. Truth be told, I love the stuff. In fact, VeganMoFo caught me in the middle of an oatmeal kick. I rotate between three morning meals – dry cereal, bagels with fruit preserves, and oatmeal – jumping from a run of one to a run of another, usually on a monthly basis. I’ve been stuck on oatmeal for a few months now, so come to think of it, I’m long overdue for a change. 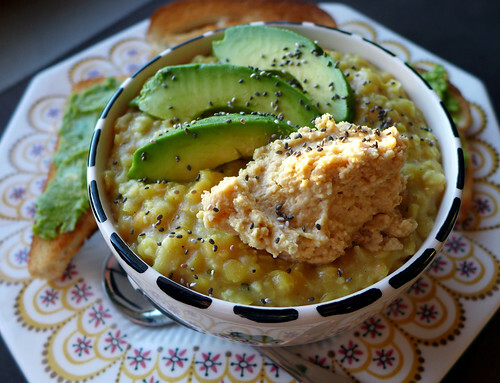 But after this post, I might never eat dry cereal or a bagel for breakfast again! So many possibilities, so quick and simple – and so delicious! First thing in the morning, I start out with a cup of juice with which to down my morning supplements. Before sitting down with my drink, I get the oatmeal going: I pour about 1 1/2 cups of quick oats into a bowl, sprinkle on a little sugar and cinnamon (purchased separately, but mixed in an old margarine container for maximum efficiency – I’m not too coordinated in the AM! ), cover the concoction with some water and/or soy milk, and let it sit for a bit. When I’m ready to eat, I toss in a handful of dried fruit (usually cranberries, cherries, blueberries, and/or apples) and microwave the dish for 60 seconds. Voilà! A hot, nutritious breakfast in less than three minutes! I especially love how Silk’s seasonal Pumpkin Spice soymilk tastes in oatmeal (and tea! ), but alas, the year’s still a little middle-aged for Pumpkin Spice. Well, at least it gives me something to look forward to! Well, now that I’ve said just about everything there is to say about oatmeal, let’s have a look at those ingredients. Update, 3/30/09: Actually, I take that back. The lemon cookies weren’t so much a huge plate of FAIL as an exercise in delayed gratification: they tasted much better the next morning, once the doughy-ness had transformed to chewiness. Methinks the problem rests not in the batter or cook time, but in my lack of a cooling rack. Currently, I have to remove freshly baked cookies from the sheet asap, otherwise they tend to stick. The lemon cookies probably needed to sit a bit, hence the trouble I encountered when scraping them off. A cooling rack might make all the difference. The last time I made a batch of Oatmeal Banana Cookies, I wasn’t able to enjoy them as much as I would’ve liked. Truth be told, I felt a wee bit guilty. The dogs, you see, started begging like lil’ vegan monsters before the goodies even came out of the oven. I’m fairly certain that they thought the cookies were meant for them, since the week before I’d made some pizza biscuits for Rennie’s birthday. So I resolved to adapt the recipe to make a doggy edition. Which I did, yesterday. 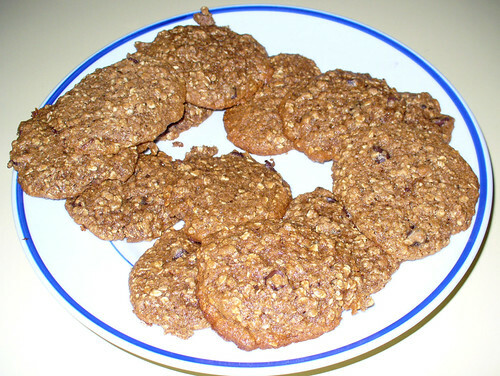 I took the last version of the human Oatmeal Banana Cookie recipe and made a few changes: omitted the salt, cut the sugar down to almost nothing, and added a few extra ingredients that I just so happened to have on hand. The result? Total success! The dogs absolutely loved the cookies. They’re also 100% suitable for human consumption (really, shouldn’t everything we feed our nonhuman friends be? ), if a little bland. By which I mean unsweetened. But maybe unsweetened is your thing? Again, this recipe has proven extremely versatile. The oat/soymilk combo makes the dough impossible to mess up: Too dry? Add some soymilk! Too wet? Toss in some oats and/or let sit! As long as you taste test the dough before baking, and like what goes in, you’ll love what comes out of the oven. Oatmeal Banana Cookies: Doggy edition! Note: If this is for your furry friends, do not use chocolate chips! Or raisins! Or grapes! Or onions or onion powder! Um, not that you’d put onions in oatmeal banana cookies. That would just be gross. Optional: Add some backstrap molasses, nutmeg and/or wheat germ. In which my Oatmeal Banana Cookies get even better. Right before I got sick last week, I made another batch of those super-awesome “Best Oat Cookies that Ever Existed,” courtesy of satan at VegWeb. 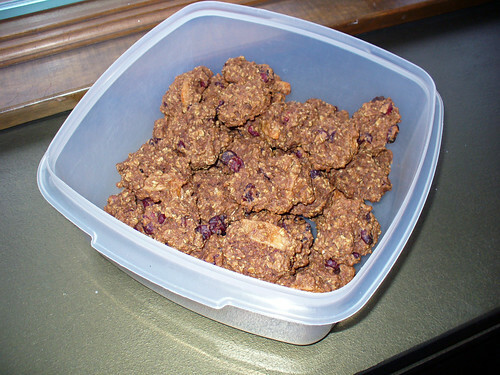 I wanted to try a healthier version – especially considering how quickly I scarfed ’em all down before – so I tweaked the recipe a bit: I cut the sugar nearly in half, added an extra banana, and threw in some dried cranberries along with the chocolate chips. The new batch came out even better than the original; the sweetness of the dried fruit more than made up for the lost sugar. I hope to try it again when I’m able to procure some dried cherries and blueberries, maybe some apricots, too. Alas, the only dried fruit currently residing in my cupboard is cranberries, so I guess the extra-loaded version of this recipe will have to wait. "The best cookies you’ve ever made." 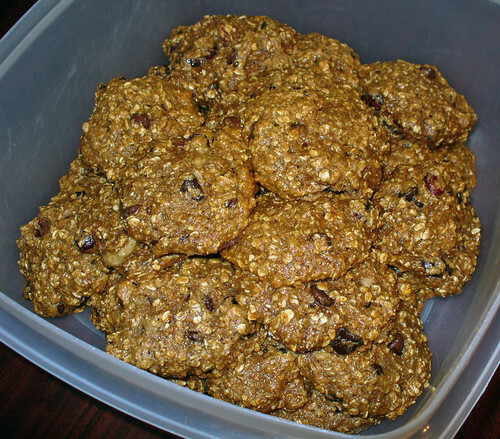 So said Shane last night, upon tasting these super-yummy banana-oatmeal cookies, from satan (!) on VegWeb. After nearly 24 hours of nonstop snacking, I’ve got to agree. As usual, my amateur-at-best photos don’t come anywhere close to doing this dessert justice. I think it’s the banana-oatmeal base that really makes these cookies rock. I tossed in some chocolate chips, but methinks the recipe would be just as good without the chocolate bling. For a healthier cookie, substitute dried cherries, cranberries, blueberries and/or apples (and/or some walnuts or similar) in place of the chocolate chips. Or, heck, in addition to. This recipe strikes me as super versatile. And not having to muck with egg substitute? Priceless. Keep reading for my modified version of the VegWeb recipe.